“Where others are satisfied with theory, we validate our data with real-life values.” Wolfgang Dürheimer, President of Bugatti Automobiles S.A.S. The Chiron is powered by a 7.993 litre V16 quad-turbo 1,500 hp engine that generates 1,180 lb-ft of torque. Using the Top Speed Key, Montoya activated the Top Speed mode, which allows a Chiron to go faster than 380 km/h. He placed his left foot firmly on the brake pedal; engaged first gear and activated Launch Control. The digital display beside the speedometer acknowledges the command received and the 1,500 horses wake up. Montoya pressed the accelerator to the limit with his right foot. The engine runs up to 2,800 rpm; the turbochargers speed up; he releases the brake pedal and all four wheels receive equal power and grip. The traction control prevents the wheels from spinning. In combination with ESC (Electronic Stability Control), it catapults the Chiron forward, keeping it firmly on track. Full acceleration. The new high-performance tires, developed by Michelin, now face extreme loading. At a speed of 400 km/h, centrifugal force converts one gram of rubber into 3,600 grams. A tire valve that only weighs 18.3 grams when stationary develops a hefty force of approximately 45 kilograms at that speed. 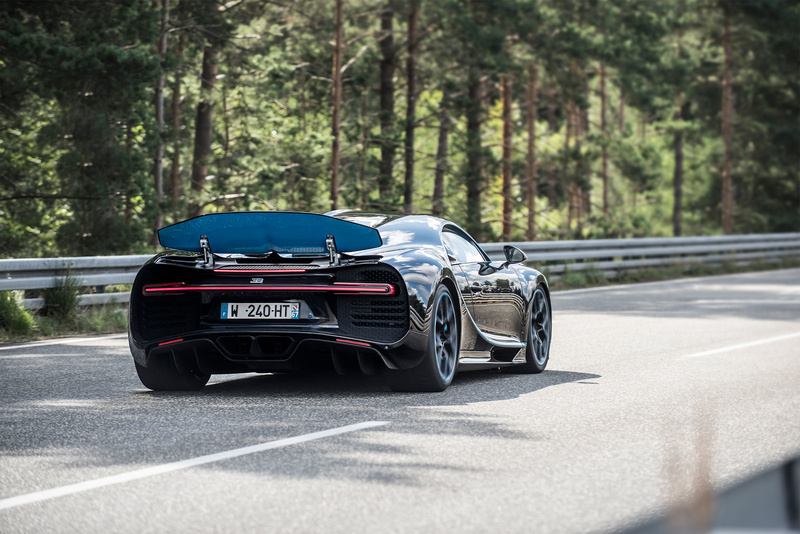 Only 32.6 seconds and 2.6 km later, the Chiron reaches the 400 km/h mark. With extremely fast reactions, Juan Pablo Montoya stepped firmly on the brakes. Only 0.8 seconds after pressing the brake pedal, the rear wing moves up to an angle of 49 degrees, forming an air brake that decelerates the Chiron extremely effectively. In the Top Speed mode at 400 km/h, the airbrake boosts the aerodynamic downforce on the rear axle by about 900 kg. That corresponds to the kerb weight of a VW Golf II. 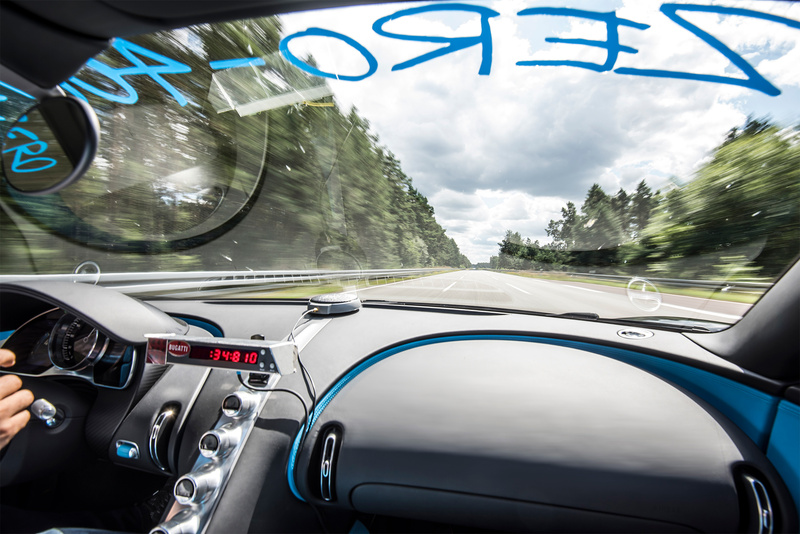 During full braking with a Chiron from 400 km/h, the force on vehicle and driver is about 2 g, similar to that experienced during the launch of a space shuttle. The brakes of the Chiron, with their special carbon ceramic brake discs (diameter of 420 mm at the front, 400 mm at the rear) and brake calipers developed especially for Bugatti with eight titanium pistons on each wheel at the front and six at the rear, develop absolutely peak performance. 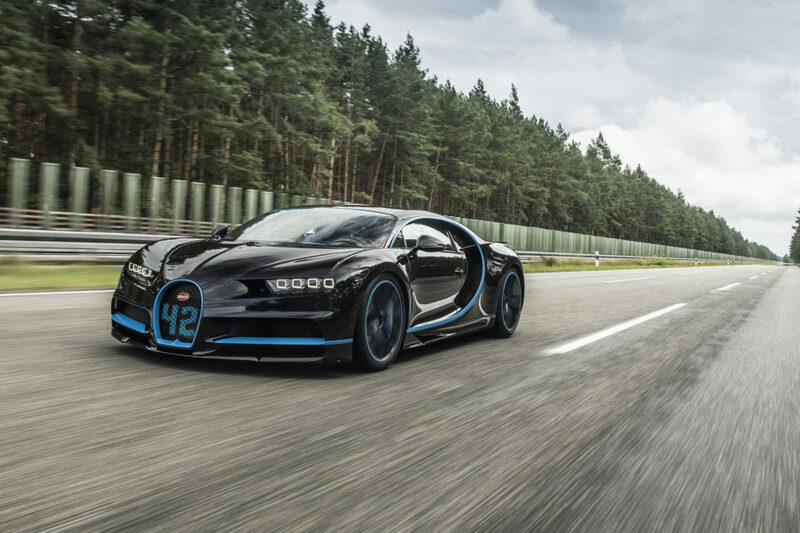 In just 9.3 seconds and 491 metres, the Chiron comes to a halt. 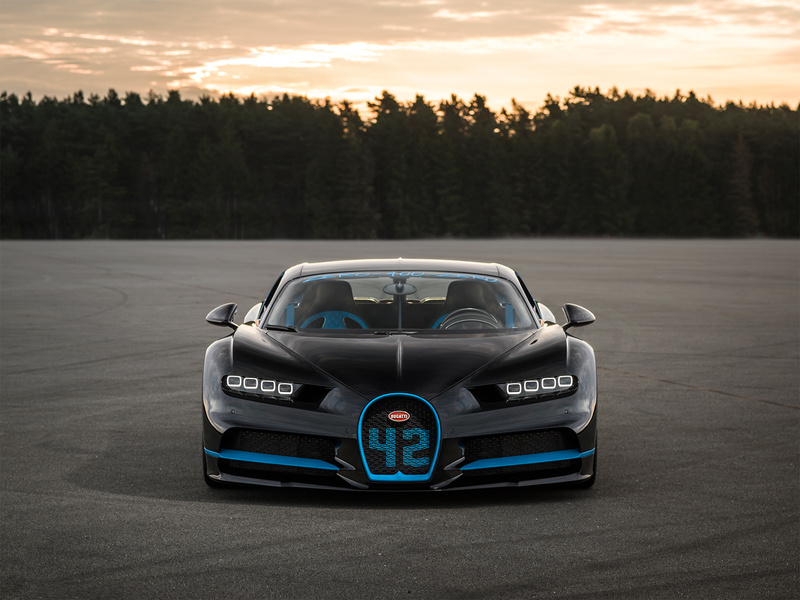 For its 0-400-0 project, Bugatti invited Juan Pablo Montoya, a proven speed and performance expert. He accepted the invitation without any hesitation.